In 1955 my Dad received the following letter. 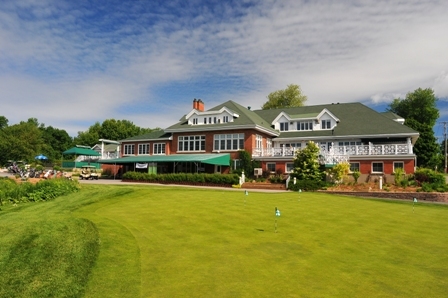 He had joined the Rivermead Golf Club in Aylmer, (now Gatineau) Quebec. A life long golf nut, I am not sure where he played in the intervening years after the McKellar Park course that he grew up beside, closed in 1952. I am now the proud owner of his membership share. Yesterday I made the pilgrimage to play the Rivermead course with 3 friends for old time’s sake. After the game I would be given a coke and a snackbar to enjoy outside while the men had a beer. I also remember big pitchers of shandy – beer and ginger beer that my Dad let me try on a hot day. It was the best of times. All winter long Dad would read books on golf and strengthen his grip with rubber dog bones. Periodically, he would exclaim, “I’ve found the secret!” (to improve his game for next year’s playing.) I think he shot in the low to mid 80s – not bad for a weekend golfer. So yesterday in the blistering heat, here we are at the club, teeing off on this iconic golf course founded in 1910. Of course I flubbed my tee shot – I was just too flooded with memories. The course (unfortunately for me) was totally redesigned in the 1980s, so all the holes and layout have changed from what I remember. The course is in immaculate green condition with baby skin fairways and extremely fast greens. In the heat and wind it played long. I found a bit of my game on the back 9 but failed to break 100. It was a great day with a great bunch of guys. Thanks Dad for the memories and thanks Steve, Larry and Tony for sharing this memorable day with me. What a beautiful story about the memory of your dad. I am so happy that you got to play there yesterday. What a great gift and blessing for you.